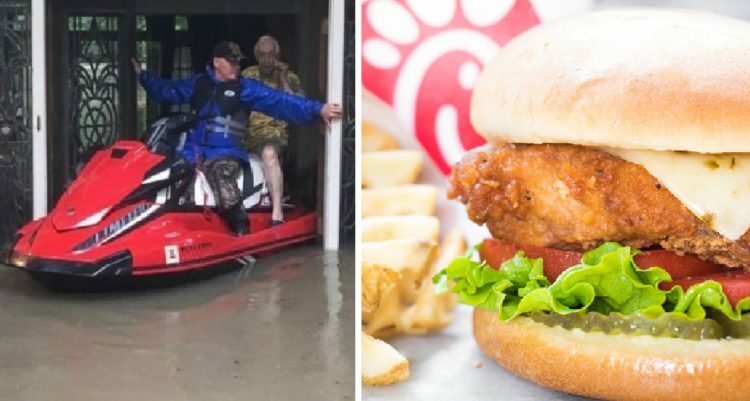 30 Aug, 2017 by	Margaret M.
When Houston area grandparents called their local Chick-fil-A to place an order for delivery, video footage from their rescue instantly went viral. Karen and J.C Spencer were riding out Hurricane Harvey until their home started flooding on Monday morning, when J.C. knew he had to evacuate. Not knowing who else to call, J.C. decided to call up a restaurant where he and his wife are regular customers. We still don’t know who the restaurant manager’s husband is, but he arrived with a boat where they loaded up a few of their possessions, but there wasn’t enough room for the both of them to escape. And then, seemingly out of nowhere, two men with two jet skis (and extra life jackets!) arrived to take them to safety. Good Morning America gave more information on the rescue, saying that volunteers later brought them back to the house because J.C. had forgotten his wedding ring and wallet, saying that he “couldn’t save my house but I had to save my marriage.” Their four children, ten grandchildren and five great-grandchildren must be so relieved at the kindness of strangers. At this time, we do not know whether they received their Chick-fil-A order and why they didn’t ask for waffle fries too.